How to Setup Internal Wiki in RepairDesk? For a successful organization, it is imperative that all team members are on-board and collective knowledge is archived and shared with each other. However in most cases, similar instructions and procedures are communicated at work place again and again, killing your precious time in the process. 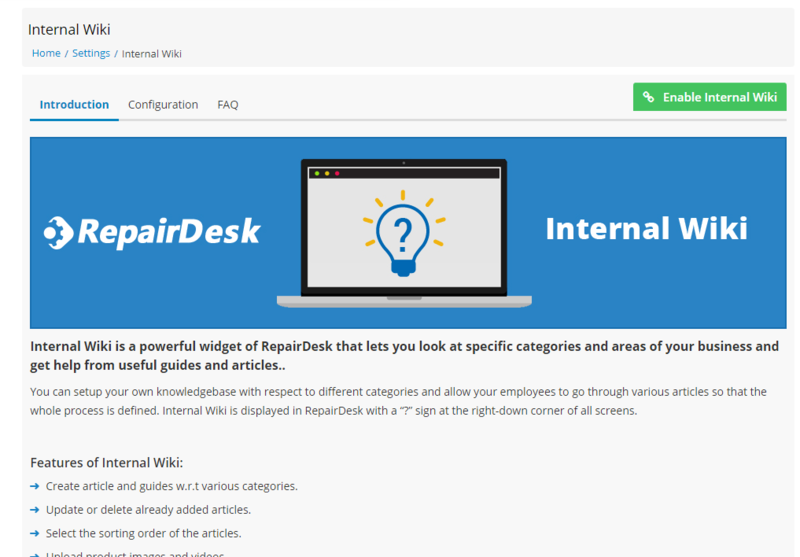 To help you optimize and bring all of your employees and team members on a single page, RepairDesk has introduced its latest functionality - Internal Wiki. With Internal Wiki you can store all your workflow, business flow, work manuals and other important content in one place, accessible to all of your team members and employees. How to Setup Internal Wiki? 1. Click on Menu Icon and from the drop-down menu select Integrations. 2. Search through the Integrations page or click on Internal Wiki Tab. 3. Click on Internal Wiki. You will be taken to Internal Wiki Configuration & Settings page. 4. Click on Enable Internal Wiki to activate it on your RepairDesk account. 5. Click on Basic Configuration page. Here you can add new categories, decide whether this is a parent category or subcategory from Category Leve drop-down menu. Enable the trigger Visible todisplay the category on Internal Wiki. Disabling this trigger will not display this category on Internal Wiki. 6. To manage categories, click on Manage Categories tab. Click on the "+" icon to see subsections under a category. To dispaly or hide a category, enable/ disable the trigger Visible. 7. To delete a category or sub-category, simply click on the Trash icon against the category under consideration. 8. You can hide a subcategory as well by clicking on the "+" icon against a main category and disabling the Visible trigger from the cascading menu. 10. To add content to Internal Wiki, click on Wiki tab on the bottom right corner of the screen. Once the mini-window opens, click on the "+" icon on the top right corner to create new content for Internal Wiki. 11. Select Category and Sub category in which you want to add the content. 12. Write the title of the content, enter text, images or embed videos and format content according to your desire. Once done, click on the Save button. Now this content would be available on your Internal Wiki. 13. To view the newly added content, click on the Intrnal Wiki window tab. Select Main category, sub-category and click on the Content Title from the drop-down list. Congratulations! Now your team members or employees can access important content and documents on Internal Wiki. How Can I Integrate QuickBook Plus with RepairDesk? How To Set Up Woocommerce Integration in RepairDesk? How to Integrate Slack with RepairDesk? How Can I Integrate MailChimp with RepairDesk? How Can I Use UnlockBase Integration? How to Integrate Xero with RepairDesk? How to configure Google Calendar? How can I use DHRU Fusion API?